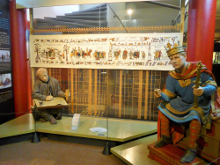 Is this the end of the Bayeux Tapestry? 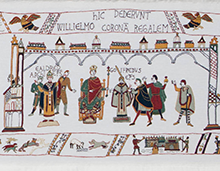 "It is still virtually intact, apart from the loss at the end of perhaps 3 metres of cloth which in most experts' view would have showed William the Conqueror crowned in Westminster Abbey, a scene to match Edward the Confessor enthroned at the start (for a brilliant - and to my eye convincing - reimagining of the lost section by the embroiderers of Alderney, see alderneybayeuxtapestry.com"
Talk of the Town: Monday 14 May 2018, at the invitation of the Worshipful Company of Broderers , the Alderney Bayeux Tapestry Finale will be presented in the prestigious Carpenters’ Hall and will be the topic of the Broderers’ inaugural textile lecture entitled “HOW HISTORY WAS STITCHED UP – THE SECRETS OF THE BAYEUX TAPESTRY”. 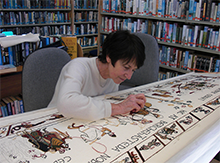 * Kate Russell, founder and project organiser of the Alderney Bayeux Tapestry, is awarded a BEM for Services to Heritage and Culture in Alderney and Normandy. The Alderney tapestry was exhibited during the Summer of 2014 at the Bayeux Tapestry Museum where it was seen by 141,458 visitors. here View photos.... Thank you for supporting this exciting project. The Alderney Tapestry community project - has been commemorated with a beautiful set of postage stamps released in 2014. The different scenes feature on a new series of stamps printed on cotton - which we believe has never been done by any other postal administration in Europe. The stamps are on sale at the Alderney Post Office. A great collectors item! 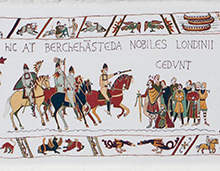 It measures just under 3 metres in length and 50 cms in height – compared to the original Bayeux Tapestry which extends to 68,38 metres. Yet, Alderney’s Bayeux Tapestry Finale has made a big impact on all who have been involved in creating this superb community project. It has captured the interest of the worldwide media and has fascinated hundreds of people who have been involved in the creation of this unique version. “It is a little known fact that the Bayeux Tapestry is incomplete. The famous embroidery tracks in 58 scenes the events of the Norman conquest leading up to the Battle of Hastings, but runs out before this period of history reaches its conclusion: the coronation of William the Conqueror in London on Christmas Day in 1066”..
Widget Finn – Weekend Telegraph, 10 November 2012. In fact, most experts now believe that a piece between 8-10 feet depicting the coronation of William I would have been included in the original work. 2016 marked the 950th anniversary of the Norman Conquest. But what really happened after the Battle of Hastings on 14 October 1066? In fact, most experts now believe that a piece between 8-10 feet, depicting a scene of the coronation of William I, would have been included in the original work. However, an embroidered panel produced in the Channel Island of Alderney has delivered the missing chapter with a plausible conclusion. The project was conceived of by three Alderney residents: Kate Russell who originated the project, artist Pauline Black who produced the designs and Robin Whicker who created the inscriptions, using the Latin current at that time. and, assisted with expertise from Oxford-based Jane Bliss, the creators Kate Russell and Pauline Black decided this should become a true community project. On 28 February 2013, this unique and ambitious masterpiece, was finally completed. 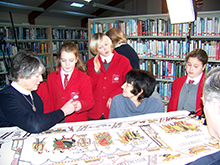 On Friday 5 April 2013, when Alderney's tapestry was officially unveiled on the island by the curator of the Bayeux Tapestry Museum , Mme Sylvette Lemagnen, and the President du Conseil de la Manche Monsieur Jean François Le Grand, Alderney's Bayeux Tapestry finale instantly received their seal of approval. 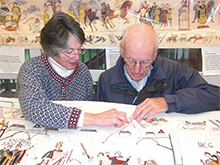 From 1 July until 9 September 2014 Alderney’s Finale was exhibited in the Bayeux Tapestry Museum under the same roof as the world-famous Bayeux Tapestry and was seen by over 140,000 visitors. Alderney’s Finale has created so much interest that a high quality replica of the tapestry has been retained by the Bayeux Tapestry Museum. 2016 marked the 950th anniversary of the Norman Conquest, and our tapestry was taken on a roadshow to different historic locations in the Channel Islands and the UK, starting with the market town of Battle. from October to end of year 2016 and in 2017 it travelled across the Channel Islands which included lectures at St. Anne's School in Alderney, the Ladies College , Blanchelande College and Elizabeth College in Guernsey, and Jersey's College for Girls and Les Quennevais School in Jersey. 23 Jan - Cambridge University - 'Hidden Meanings in the Bayeux Tapestry and Alderney's Conclusion' - a captivating presentation by Kate Russell and Pauline Black. Event organised by the Cambridge Anglo-Saxon, Norse and Celtic Society. This lecture can be viewed on YouTube. 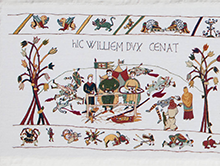 14 May: Carpenters' Hall, London - at the invitation of the Worshipful Company of Broderers Alderney’s tapestry will be the topic of the Broderers’ inaugural textile lecture entitled “HOW HISTORY WAS STITCHED UP – THE SECRETS OF THE BAYEUX TAPESTRY”. Un 'point de suture' dans le temps, comme si l'histoire commencée il y a 900 ans trouvait une fin plausible en 2013. Peu de gens savait que la Tapisserie de Bayeux était incomplète. La célèbre tapisserie retrace les évènements de la Conquête Normande, jusqu’à la bataille d’Hastings en 58 scènes. Cependant, elle se termine avant que cette période n’arrive à son terme : le Couronnement de Guillaume le Conquérant à Londres, le jour de Noël 1066. » Widget Finn – Weekend Telegraph, le 10 Novembre 2012. De fait, la plupart des experts estiment, à présent, qu’une scène de 2.5 à 3 mètres représentant le couronnement de Guillaume 1er, devrait faire partie de la tapisserie originale. Récemment, une broderie réalisée sur l’île Anglo-Normande d’Aurigny propose une interprétation plausible de la scène manquante. Depuis le début du projet, Kate Russell, habitante d’Aurigny, souhaitait que la reconstitution de la partie manquante de la tapisserie soit la plus proche possible de ce qu’avait pu être l’originale. La tapisserie d’Aurigny a été créée par Kate Russel, bibliothécaire, et par l’artiste Pauline Black, toutes deux habitantes d’Aurigny, en Février 2012 et inspirée par les travaux préliminaires de Jan Messent. Une année complète a été nécessaire à sa réalisation qui, par un effet boule-de-neige est devenue l’un des plus grands projets communautaires, impliquant plus de 400 personnes heureuses d’ajouter leurs points à cette histoire. La reconstitution de la partie manquante de la tapisserie proposée par les habitants d’Aurigny montre quatre scènes historiques importantes. Elle a été brodée suivant les mêmes techniques : tissus identiques, couleurs et types de laine similaires. La narration historique est représentée dans l’espace central de la tapisserie. Celui-ci est bordé de deux filets, l’un supérieur, l’autre inférieur, montrant des animaux mythiques similaires à ceux figurant sur la tapisserie de Bayeux. Parfois, les images figurant dans ces marges horizontales viennent commenter ou compléter la scène centrale. Et on n’aurait pas pu souhaiter une issue plus heureuse : cette œuvre unique a immédiatement reçu l’approbation générale lors de sa présentation officielle, le 5 avril 2013 au cours de laquelle Sylvette Lemagnen, conservatrice du Musée de la Tapisserie de Bayeux et M. Jean-François Le Grand, Président du Conseil de la Manche l’avait dévoilée au public. Du 1 juillet au 9 septembre la tapisserie d'Aurigny etait en exposition au Musée de la Tapisserie de Bayeux et vue par plus de 140,000 visiteurs. Elle est désormais à la Librairie d'Aurigny. Une replique de l'original reste en exposition au Musée de Bayeux. From the outset Kate Russell’s aim was to create a Finale that would look as though it could have been the original ending - with a slight nod towards the Channel Islands. The Alderney Tapestry is stitched on linen of the same weave as the original and with the same sort of wools in the same colours and following the same style as the original with the history of the times depicted in the central panel and with upper and lower borders which sometimes show mythical animals similar to those found in the Bayeux Tapestry and sometimes show images which augment or comment on the images in the central panel. The Battle of Hastings has been fought between Harold II of England and William II, Duke of Normandy, and William has been victorious. At the close of battle, he has set up his table and tent on the spot where Harold fell and dines with his half-brothers, Odo, Bishop of Bayeux and Robert, Count of Mortain. The bodies of the slain lie scattered about where they have fallen. ‘Rivers of blood’ flow down the hill. Anglo-Saxon women come on the following day to retrieve the bodies of their relatives. The ‘beasts of the battle’ are shown in the lower border devouring the bodies of those not buried or claimed. The caption reads, ‘Here Duke William dines. Romney, Dover, Canterbury and Winchester have submitted to William. London has resisted William, but now William has cut them off from resupplies by destroying a path about 20 miles wide to the south and west of London. He has crossed the Thames at Wallingford and has reached Berkhamsted where the nobles of London submit to his rule. The coronation of William at Westminster Abbey. William is crowned by Ealdred, Archbishop of York, assisted by Geoffrey, Bishop of Coutances, as translator. The acquiescence of the three estates of Anglo-Saxon society is shown: the clergy, the nobility and the peasants. William could not speak English and shows concern, or possibly anger, when the shout of the English, who are asked if they will accept him as king, is misunderstood by the Normans as a call for rebellion. In the ensuing chaos, the congregation flees. By the time of his coronation, William has chosen the site for the construction of the White Tower using the famous white stone which he imports from Caen. It will be through his effective fortifications that he will overcome English resistance to his rule. The tower is shown in outline to indicate that its construction lies in the future. The final caption, between the ghostly turrets of the White Tower is in Old English and reads ‘The end will be good, as God wills.’ This is the concluding line from the entry for 1066 in the Anglo-Saxon Chronicle. 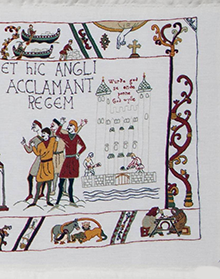 A ‘Hand of God’ identical to the ‘Hand of God’ above Westminster Abbey in the Bayeux Tapestry is shown pointing to this enigmatic phrase, which can be interpreted differently by the English and Normans. As Simon de Bruxelles points out in his article in The Times (13 Feb 2013): ‘Alderney was part of the Duchy of Normandy when Duke William won the English crown. Islanders still drink a loyal toast to “The Duke of Normandy, our Queen” and “half-jokingly refer to the islands as the senior partner in the relationship’. Wace states that William sailed to England with 696 ships. Wace says, “but I have heard my father say—I remember it well, although I was but a lad—that there were seven hundred ships, less four, when they sailed from St. Valery”. This might just have been possible, but Wace was writing in the 1160s, and the Tapestry, it is believed, was created within 20 years of the Battle of Hastings. His inclusion in this work is because he was born in Jersey. Le projet a été initié par Kate Russell début 2012 et réalisé par Pauline Black . Les inscriptions ont été rédigées en latin médiéval par l’historien local Robin Whicker. À la différence de la tapisserie de Bayeux, les îles anglo-normandes sont représentées à travers leurs emblèmes : le macareux pour Aurigny, l’âne pour Guernesey et le crapaud pour Jersey. La bataille d’Hasting opposa le roi Harold II au duc de Normandie, Guillaume II. Au terme de la bataille, remportée par ce dernier, un dîner rassemblant le Duc victorieux, son frère Odo, évêque de Bayeux et Robert, Comte de Mortain, fût dressé à l’endroit même où Harold tomba. Les cadavres éparses gisent encore là où ils sont tombés. Une rivière de sang s’écoule le long de la colline. Le jour suivant, des femmes anglo-saxonnes arrivèrent afin de retrouver les corps de leurs proches. Les « bêtes de la guerre » sont représentées sur la bordure inférieure dévorant les cadavres de ceux dont les corps n’ont été ni enterrés, ni réclamés. La légende dit : « Ici, le Duc Guillaume II de Normandie dîne ». Romney, Dover, Canterbury et Winchester sont représentés se soumettant à Guillaume II. Face à la résistance de Londres, le Duc Guillaume de Normandie a détruit un chemin d’une trentaine de kilomètres (20 miles) au sud et à l’ouest de la ville et ainsi coupé son ravitaillement. Après qu’il ait traversé la Tamise à Wallingford les nobles se sont inclinés devant son pouvoir à Bekhamstead. Les Nobles s’étant soumis ce jour là sont Edwin, Comte de Northumbria, Morcar, Comte de Mercia, Ealdred, Archevêque d’York et Edgar Aetheling, le dernier descendant masculin de la famille royale anglaise. On peut lire en légende “ici, la reddition des Nobles de Londres”. Le couronnement de Guillaume le Conquérant à l’Abbaye de Westminster. Guillaume est couronné par l'Archevêque de York, Ealdred, assisté pour la traduction par Goeffroy, évêque de Coutances. La Noblesse, le Clergé et le Tiers-Etat sont représentés en signe du consentement des trois ordres de la société. Guillaume le Conquérant, ne pouvant pas parler anglais, semble montrer une certaine inquiétude, éventuellement de la colère, lorsque les Normands interprètent le cri des Anglais, signe d’acceptation du nouveau roi, comme un appel à la rébellion. S’en suivit un chaos au cours duquel la congrégation s’enfuit. Sur la bordure inférieure de la tapisserie, on peut voir les Normands à l’extérieur de l’Abbaye,aux alentours de Southwark. La légende indique : « Ici, ils ont remis la couronne du Royaume à Guillaume » et « Et ici, les Anglais acclament le roi ». Lors de son couronnement, Guillaume avait choisi le lieu de construction de la Tour Blanche bâtie avec la célèbre pierre blanche importée de Caen. C’est grâce à ces fortifications qu’il a vaincu les résistances anglaises. La construction prochaine de la tour est annoncée par sa représentation sous forme d’esquisse. La légende finale, située entre les tourelles de la tour est écrite en anglais médiéval et dit « L’issue sera heureuse, si Dieu le veut ». Cette phrase est issue des annales concernant l’année 1066 de la Chronique Anglo-saxonne. Une Main de Dieu (Manus Deï), identique à celle de la tapisserie de Bayeux (située au-dessus de l’abbaye de Westminster), est représentée pointant cette phrase énigmatique, qui peut, en effet, être interprétée différemment par les Anglais et les Normands. 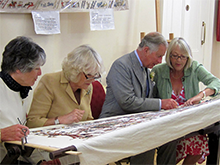 Among the stitchers were Their Royal Highnesses, The Prince of Wales and the Duchess of Cornwall who visited the island on 20 July 2012 and who were presented with a special embroidered border scene of the tapestry representing the Channel Islands of Alderney, Guernsey and Jersey. To view the list of over 400 stitchers click here (PDF format). For details of the many others who provided practical and physical assistance as well as professional support which has greatly aided the project click here (PDF format)..
All this happened and was achieved within the constrained facilities of Alderney’s Library. However, ultimately this masterpiece will be displayed at different public locations on request, acquainting others with an exciting new facet to the island’s already rich history and Norman heritage. Check the Newsflash for present location of Alderney’s tapestry. Le projet commença en Février 2012 et s’est achevé en Mars 2013. Il a été supervisé par Kate Russell et son équipe de volontaires dévoués et réalisé grâce à l’aide de centaines d’aurignais de tous âges. Des visiteurs des quatre coins du monde ont également participé à ce projet. En 2012, ce sont Leurs Altesses Royales Le Prince de Galles et la Duchesse de Cornouailles qui ont ajouté leurs points à cette œuvre unique de l’Histoire d’Angleterre. La liste des contributeurs est publié ici ainsi que ici(PDF format)..
A large selection of high resolution images can be downloaded from our Flickr Site. This also includes photos of the Tapestry on display in Battle and on its road trip to other historic locations in the UK and the Channel Islands, as well as HRH the Duke of York's viewing of the tapestry during his visit to Alderney on 10 Oct 2016. Photos are copyright Alderney Bayeux Tapestry Finale but may be used by the media.